1. It is my privilege to join you for the inaugural session of this National Summit on Corporate Social Responsibility (CSR). At first, let me congratulate the Confederation of Indian Industry (CII) for organizing this annual conclave aimed at creating a strong, sustainable CSR movement in the country. I also compliment the National Foundation for Corporate Governance, with whom the CII has partnered for this 2015 edition of the Summit. The government has over the last few months articulated the key national priorities and programmes. It is, therefore, apt that this Summit has been convened at this time on the theme “Partnering the National Agenda”. 2. I am glad to find many distinguished industry captains participating in this important event. You are leaders with sharp business acumen, valued experience and wide expertise. You are entrusted with the responsibility to manage the development of your business into models of excellence. Remember that this calls for not only sound application of management principles, but also better appreciation of the socio-economic reality in which your companies operate. You have a bigger purpose than to merely earn profits. Just as you add value to your shareholders’ wealth, it is equally important to add value to the society at large. You, as conscientious industry heads, would do well to build this emerging gospel of doing business into your corporate blueprint. 3. The notion of CSR is not new to India. Mahatma Gandhi had espoused the socio-economic philosophy of trusteeship. It provided a means for wealthy people to be trustees to look after the welfare of the common man. CSR gradually evolved into the corporate framework. CSR refers to a company’s sense of responsibility extending beyond its shareholders to all stakeholders, notably the people and ecology who are in the domain of its operation. It indicates a sense of ‘corporate citizenship’. Though a business entity incurs short-term costs without direct financial benefit, yet, it gains in the long run through the promotion of social and environmental change. 4. Indian industry has displayed a keen interest in contributing to the betterment of the society. Shouldering the task of socio-economic development is increasingly considered a shared responsibility of the government and the industry. This CSR consciousness has received a renewed impetus through a legal framework in the Companies Act, 2013. Section 135 of the Act prescribes every company eligible in terms of net worth, turnover or net profit to constitute a committee of the Board to formulate a policy for undertaking specified CSR activities. The Act also provides such companies to spend in a financial year at least two percent of the average net profits made by it during the three immediately preceding financial years. 5. This legislation could help unlock a substantial amount - estimated to be in the range of Rs. 8,000 to 20,000 crore - for social sector engagement of Indian companies. A structured development strategy is now required to ensure that these funds are efficiently deployed in areas most beneficial to society. In a country as vast as India, scalability is critical to the success of programmes. Leading industry associations like CII must encourage pooling of funds by companies to create large high impact programmes. In this context, the Foundation set up by CII to reinforce the CSR initiatives of various businesses is commendable. 6. Inclusive growth is an avowed objective of our public policy. It calls for intensive collaborative efforts of the government and the corporate sector to provide the basics for improving the quality of life in our rural and urban areas. The corporate sector must provide renewed impetus to CSR initiatives towards cleanliness, health and education. The Government has launched several important schemes in this direction. To mention a few - Swachh Bharat Mission aims at a Clean India by 2nd October, 2019 to coincide with the 150th Birth Anniversary of Gandhiji; Saansad Adarsh Gram Yojana envisages the integrated development of selected villages. The corporate sector can work at various models to develop a synergetic relationship in the implementation of these schemes. 7. In the sphere of health and education, many companies have established reputed institutions. The private sector can extend the good work to rural areas by meeting the infrastructure requirements in government schools and investing in teacher up-skilling. Companies can adopt specific blocks or districts for such intervention. This can be synergized with efforts to tackle malaises like malnutrition and other health-related issues. It is heartening to note that CII through its member-companies has committed to build about 10,000 toilets in schools. This effort will not only help develop quality culture but also bring children, especially the girl child, to schools. 8. A demographic transition is underway in India, with half our population of 125 crore under 25 years of age. In less than a decade, we will possess the largest working-age population in the world. India’s large, youthful population can become a dividend only if they are empowered and enabled to fulfill their potential. The onus is on us collectively to train and skill 50 crore youth by 2022. I am confident that the industry will prove to be more-than-an-able partner in the efforts of the government. 9. The corporate sector must also venture beyond the mandated CSR spend - to activities such as energy conservation; environment protection; and development of an innovative spirit among workers to foster productivity and industrial growth. To my mind, more than money, important socio-economic objectives need innovative ideas, technology and management for their speedy realization. The Indian industry must leverage its strengths and competencies, and lend its expertise in a wide array of programmes. 10. Given the diversity and level of development in different parts of our country, CSR cannot be a one-size-fits-all approach. While developing programmes, industry leaders and CSR experts must look at issues that are relevant to different regions. At the same time, they must ensure that companies look across India and not concentrate on a few pockets. The industry must work closely with non-governmental organizations. They have the pulse of development needs at the grassroots and can provide last mile connectivity in the delivery of programmes. 11. The corporate sector must also build a dedicated cadre of volunteers, who can bring individual energy and creativity for transformational change. The India@75 programme of CII was started with a vision to see India emerge as a world leader through economic strength, technological vitality and moral leadership by 2022. It is a platform to bring together young entrepreneurs who want to make a difference to the country. CSR must become a critical component of this initiative. 12. Disseminating information about the work done by companies is necessary to create a positive sentiment about CSR. Equally important is to sustain the work that a company has initiated in this area. I am told that the Indian Institute of Corporate Affairs, Bombay Stock Exchange and CII have joined hands to develop the world's first CSR exchange. It will help the corporate sector to become socially responsible, connect with implementing partners, and comply with the new CSR requirements. I compliment you all for the same. 13. I am sure this CSR Summit will generate many innovative ideas and methods towards building an inclusive, compassionate and responsive society in India. I look forward to receiving its outcomes and the work plan for the coming year. I wish the Summit great success. I also wish you all Godspeed in your endeavours. Let me conclude in the words of Mahatma Gandhi: “Man becomes great exactly in the degree in which he works for the welfare of his fellowmen”. 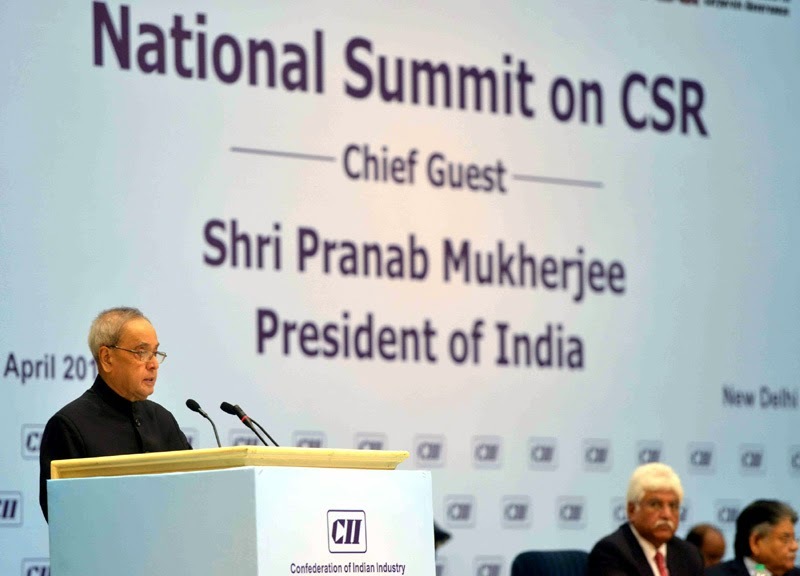 The President of India, Shri Pranab Mukherjee addressed the inaugural session of the National Summit on CSR (Corporate Social Responsibility) on the theme ‘Boardroom and Beyond’ organized by the Confederation of Indian Industry (CII) today (April 29, 2015). The President also unveiled the logo of ‘Sammaan’, a platform for CSR created jointly by Bombay Stock Exchange (BSE), CII and Indian Institute of Corporate Affairs. Speaking on the occasion, the President said inclusive growth calls for intensive collaborative efforts of the government and the corporate sector to provide the basics for improving the quality of life in our rural and urban areas. Corporate sector must provide renewed impetus to CSR initiatives towards cleanliness, health and education. The President said the CSR provision in the Companies Act, 2013 will help unlock a substantial amount - estimated to be in the range of Rs. 8,000 to 20,000 crore - for social sector engagement of Indian companies. A structured development strategy is now required to ensure that these funds are efficiently deployed in areas most beneficial to society. In a country as vast as India, scalability is critical to the success of programmes. Leading industry associations like CII must encourage pooling of funds by companies to create large high impact programmes. In this context, the Foundation set up by CII to reinforce CSR initiatives of various businesses is commendable. It is a great pleasure for me to welcome Your Excellency and the distinguished members of your delegation on your first State Visit to India. I am particularly delighted that you have honoured us by staying at the Rashtrapati Bhavan. Although you have travelled here in your previous capacities on a number of occasions, this is a special visit. This time, you are visiting India as a leader of the National Unity Government in Afghanistan, as President of a proud nation with whom India has a cherished history of profound cultural, religious and civilisational bonds. It has always been a matter of pride for us that India is Afghanistan’s first Strategic Partner. We are happy that our bilateral co-operation, rooted in the age-old bonds of friendship between our two peoples, has been so constructive and fruitful. We believe that the enduring trust and mutual understanding between India and Afghanistan goes beyond political and strategic considerations. Our shared history and geography are a compelling factor in nurturing our close ties. Because of this historical reality, there has been strong and sustained support in India for our engagement with Afghanistan in its post-conflict economic reconstruction effort. Over the last fourteen years, India and Afghanistan have effectively implemented a number of projects for the reconstruction of Afghanistan. In 2011, our countries signed a Strategic Partnership Agreement to provide a carefully conceived architecture for our multi-faceted dialogue and collaboration. We are confident that over the next few years, Afghanistan will see a significant transformation across its sectors and in all areas of its social and economic advancement. We look forward to this with all sincerity. We consider it a privilege to share our capabilities and experience in nation-building and inclusive development with our Afghan brothers. We continue to be fully committed to this – and shall be happy to support their endeavours in every way that you may require. Our engagement with Afghanistan, Your Excellency, has neither an expiry date nor a timeline. As a friend and neighbour, India will always stand firmly beside Afghanistan. We remain deeply conscious that Afghanistan's unity, independence, security and stability are critical – not only for itself – but also for India and for peace and progress in our entire neighbourhood. To this end, our Strategic Partnership looks to strengthen and diversify our bilateral engagement in the coming years, including by forging a more robust trade and investment relationship between our private sectors. I am confident, Mr. President, that your interactions with our Government during this State Visit will give you a very clear perception of our purpose and commitment. With these words, Excellency, I once again welcome you to India and to the Rashtrapati Bhavan and wish you and your distinguished delegation a comfortable stay and a very successful visit. to the everlasting friendship and co-operation between India and Afghanistan. The President of India, Shri Pranab Mukherjee yesterday (April 28, 2015) received His Excellency Mohammad Ashraf Ghani, the President of the Islamic Republic of Afghanistan at Rashtrapati Bhavan. He also hosted a banquet in his honour. Welcoming President Ghani on his first state visit to India as the President of Afghanistan, President Mukherjee conveyed his condolences over the tragic death of 52 persons in a land slide in the Badakhshan Province earlier in the day. He said India was proud of its close relations with Afghanistan. It was Afghanistan’s first strategic partner. India shares the Afghan President’s goal of building a strong, prosperous and independent Afghanistan. It appreciates the work he is doing and the formation of a national unity government which adds a new dimension to the process of democratic evolution in Afghanistan. The President said India supports an Afghan led and Afghan owned national reconciliation process within the framework of the Afghan constitution. India-Afghanistan co-operation has neither an expiry date nor a timeline. As a friend and neighbour, India will always stand firmly beside Afghanistan. India considers it a privilege to share its capabilities and experience in nation-building and inclusive development with people of Afghanistan. The President said efforts should be made to expand bilateral trade which in 2013-14 stood at US$ 683.10 million. 72 Indian companies have invested around US$ 17 million in Afghanistan from 2003-2013. India will encourage more companies to invest in Afghanistan. He expressed confidence that Afghan President’s visit will further strengthen the two countries successful co-operation in all spheres of shared interest. Responding to the President Mukherjee, the Afghan President said it was a singular honour to be invited to stay in Rashtrapati Bhavan and an important recognition granted to the people of Afghanistan. President Ghani thanked President Mukherjee for his condolences and expressed sympathies for the people of Nepal dealing with the aftermath of the earthquake. He conveyed appreciation for India’s leadership in natural disaster management and called for a regional framework for the purpose. President Ghani said Afghanistan hopes it will have a shared destiny and destination with India in Asia. Later, in his banquet speech, President Mukherjee said although the Afghan President has travelled India in his previous capacities on a number of occasions, this is a special visit. This time he is visiting India as leader of the National Unity Government in Afghanistan and as President of a nation with whom India has a cherished history of profound cultural, religious and civilisational bonds. The President said India believes that the enduring trust and mutual understanding between India and Afghanistan goes beyond political and strategic considerations. The two countries shared history and geography is a compelling factor in nurturing our close ties. Because of this historical reality, there has been strong and sustained support in India for its engagement with Afghanistan in its post-conflict economic reconstruction effort. India is confident that over the next few years, Afghanistan will see a significant transformation across its sectors and in all areas of its social and economic advancement. The President said India remains deeply conscious that Afghanistan's unity, independence, security and stability are critical – not only for itself – but also for India and for peace and progress in entire neighbourhood. To this end, the two countries strategic partnership looks to strengthen and diversify bilateral engagement in the coming years, including by forging a more robust trade and investment relationship between private sectors. The President of Afghanistan in his banquet speech said for many Afghans who grew up in the 1950s, India was not the country that was “over there.” It was part and parcel of how they learned their values, sense of history, and commitment to building a free and just nation. For the children of 1950s Afghanistan, Maulana Abul Kalam Azad, Mahatma Gandhi and Jawaharlal Nehru were not just distant figures. They were inspiring writers whose texts gave a generation of Afghans their understanding of the oppressive nature of British colonialism, of India’s noble quest for freedom, and the profound commitment to justice that inspired that heroic generation of leaders. India has been a foundational partner for Afghanistan. Over thirteen thousand Afghan youth are studying in India. India’s incredible generosity in providing health care, training, cultural exchanges and other much appreciated help continues thousand year old history of friendship of India and Afghanistan. Afghanistan thanks India for its assistance and for the promise of future cooperation that will help Afghanistan achieve self-reliance within a neighborhood of partners committed to the principles of democracy, development and mutual security. President Ghani said despite difficulties, Afghanistan can be a critical partner for India for the project of building an integrated Asian powerhouse that is to come. Afghanistan is not just metaphorically but literally located in the heart of Asia. With commitment, investment, peace, railways, pipelines, highways, fiber-optic networks and the ideas and people that will connect Central, South and West Asia to each other and with the market centers of the world can more easily flow through Afghanistan than through any other route. Shri Punam Suri, President, DAV College Managing Committee, today called on the Prime Minister, Shri Narendra Modi and presented him a cheque of Rs. 2 Crore towards Prime Minister National Relief Fund (PMNRF). A delegation of media-persons from Madhya Pradesh, currently on an assignment with the Bureau of Parliamentary Studies and Training, today called on the Prime Minister, Shri Narendra Modi. During the interaction, the Prime Minister urged the media-persons to keep the interests of the country in the mind, while performing their duties. He also exhorted them to promote and highlight activities related to "Swachh Bharat." In a determined bid to recast the urban landscape of the country to make urban areas more livable and inclusive besides driving the economic growth, the Union Cabinet chaired by Prime Minister Shri Narendra Modi today approved Central Government spending of about one lakh crore on urban development under two new urban missions over the next five years. The Cabinet has approved the Smart Cities Mission and the Atal Mission for Rejuvenation and Urban Transformation of 500 cities (AMRUT) with outlays of Rs.48,000 crore and Rs.50,000 crore respectively. Under the Smart Cities Mission, each selected city would get central assistance of Rs.100 crore per year for five years. Smart City aspirants will be selected through a ‘City Challenge Competition’ intended to link financing with the ability of the cities to perform to achieve the mission objectives. Each state will shortlist a certain number of smart city aspirants as per the norms to be indicated and they will prepare smart city proposals for further evaluation for extending Central support. This Mission of building 100 smart cities intends to promote adoption of smart solutions for efficient use of available assets, resources and infrastructure with the objective of enhancing the quality of urban life and providing a clean and sustainable environment. Special emphasis will be given to participation of citizens in prioritizing and planning urban interventions. It will be implemented through ‘area based’ approach consisting of retrofitting, redevelopment, pan-city initiatives and development of new cities. Under retrofitting, deficiencies in an identified area will be addressed through necessary interventions as in the case of Local Area Plan for downtown Ahmedabad. Redevelopment enables reconstruction of already built-up area that is not amenable for any interventions, to make it smart, as in the case of Bhendi Bazar of Mumbai and West Kidwai Nagar in New Delhi. Pan-city components could be interventions like Intelligent Transport Solutions that benefits all residents by reducing commuting time. Under smart cities initiative, focus will be on core infrastructure services like: Adequate and clean Water supply, Sanitation and Solid Waste Management, Efficient Urban Mobility and Public Transportation, Affordable housing for the poor, power supply, robust IT connectivity, Governance, especially e-governance and citizen participation, safety and security of citizens, health and education and sustainable urban environment. Smart City Action Plans will be implemented by Special Purpose Vehicles(SPV) to be created for each city and state governments will ensure steady stream of resources for SPVs. The two missions are interlinked. AMRUT adopts a project approach to ensure basic infrastructure services relating to water supply, sewerage, septage management, storm water drains, transport and development of green spaces and parks with special provision for meeting the needs of children. Implementation of this Mission will be linked to promotion of urban reforms such as e-governance, constitution of professional municipal cadre, devolving funds and functions to urban local bodies, review of Building bye-laws, improvement in assessment and collection of municipal taxes, credit rating of urban local bodies, energy and water audit and citizen-centric urban planning. 10 percent of budget allocation will be given to States/UTs as incentive based on achievement of reforms during the previous year. A reform matrix with timelines would be circulated to States in the Guidelines. This Mission will be implemented in 500 cities and towns each with a population of one lakh and above, some cities situated on stems of main rivers, a few capital cities and important cities located in hilly areas, islands and tourist areas. Under this Mission, States get the flexibility of designing schemes based on the needs of identified cities and in their execution and monitoring. States will only submit State Annual Action Plans to the Centre for broad concurrence based on which funds will be released. In a significant departure from JNNURM, Central Government will not appraise individual projects. Central assistance will be to the extent of 50 percent of project cost for cities and towns with a population of up to 10 lakh and one-third of the project cost for those with a population of above 10 lakh. Central assistance will be released in three instalments in the ratio of 20:40:40 based on achievement of milestones indicated in State Annual Action Plans. AMRUT seeks to lay a foundation to enable cities and towns to eventually grow into smart cities. The Cabinet also today approved Central funding under AMRUT to the projects sanctioned under JNNURM and not completed. JNNURM projects relating to urban development sanctioned during 2005 -2012 and achieved physical progress of 50 percent availing 50 percent of central assistance released and those sanctioned during 2012-2014 will be supported till March, 2017. Accordingly, 102 and 296 projects respectively will get Central support for balance funding to complete these projects. Central spending approved for the next five years under the two new Missions assumes significance in the backdrop of the approved Plan outlay of Rs.42,900 crore for JNNURM that was implemented over nine years between 2005 and 2014. Out of this, actual Central assistance released was Rs.36,398 crore. Further to today’s Cabinet approval, a minimum investment of over Rs. 2 lakh crore would flow into urban areas over the next five years (2015-16 – 2019-20) since States and urban local bodies would mobilise matching resources ranging from 50 percent to 66 percent. In addition, substantial private investments would be mobilized by states and urban local bodies through PPP model as required to meet project costs. The architecture of the Smart Cities Mission and AMRUT is guided by the twin objectives of meeting the challenges of growing urbanization in the country in a sustainable manner as well as ensuring the benefits of urban development to the poor through increased access to urban spaces and enhanced employment opportunities. The Union Cabinet chaired by the Prime Minister, Shri Narendra Modi, today gave its approval toincrease import duty on sugar from 25 percent to 40 percent. 1) The duty on import of sugar under the Open General License (OGL) shall be increased to 40 percent, as against the current level of 25 percent. This would prevent any imports in case international prices of sugar were to depress further. 2) The “Duty Free Import Authorization” scheme (DFIA), for sugar would be withdrawn. Under the DFIA, exporters of sugar could import duty free, permissible quantities of raw sugar for subsequent processing and disposal. To prevent leakage of sugar made from such duty free imports in the domestic markets, the DFIA scheme for sugar would be withdrawn. 3) Similarly, the period for discharging Export Obligations under the Advanced Authorization Scheme for sugar would be reduced to six months, so as to prevent any possibility of any leakage into the domestic markets. 4) Removal of excise duty on ethanol supplied for blending. It has been decided that ethanol produced from molasses generated during the next sugar season and supplied for ethanol blending would be exempted from excise duty and the price benefit would be passed on the to the sugar mills/distilleries.Presently 12.36 percent central excise duty is levied. These measures will significantly improve the adverse price sentiments in respect of sugar and would improve the liquidity in the industry, facilitating the clearing up of arrears of canedues to farmers. The past four years have witnessed continued overproduction of sugar as compared to domestic requirements. This has depressed sugar prices; consequently the mills have been constrained for liquidity and are facing difficulties in clearing cane dues owed to the farmers. This has affected the incomes of 50 million sugar cane farmers. Similar conditions of subdued prices prevail in the global markets. The Government has, from time to time, provided financial assistance to the industry to overcome liquidity constraints such as providing interest free working capital loans and incentives for raw sugar exports. However, due to adverse price sentiments plaguing the sector, problems of cane dues arrears persist. As on 31stMarch 2015, the cane dues arrears stood at Rs.20,099 crore which is higher than the previous year. The Union Cabinet chaired by the Prime Minister, Shri Narendra Modi, today gave its approval to reimburse amount of value cut on wheat procurement price to States. As per latest report of FCI, a total quantity of 158.61 lakh tonnes of wheat has been procured during the current season in various States as against the procurement level of 169.29 lakh tonnes achieved by this date in previous year. Due to untimely rains and hailstorms etc. in March-April this year, the quality of wheat has been badly affected and to facilitate purchase of affected wheat from the farmers at the Minimum Support Price (MSP), the Food Ministry has given relaxation in quality norms of wheat with respect to luster loss and increase in quantum of shriveled and broken grains in various States. While doing so, the Food Ministry has imposed a nominal value cut on wheat procured under relaxed specifications, so that, separate marking and stocking of such stock and its utilization on priority could be ensured. Looking at the problems of the farmers, most of the State Governments have decided to bear the amount of this value cut themselves and not to pass this on to farmers. The Union Cabinet chaired by the Prime Minister, Shri Narendra Modi, today gave its approval for introduction of the Compensatory Afforestation Fund Bill, 2015 in Parliament during the current session. The proposed legislation seeks to provide an appropriate institutional mechanism, both at the Centre and in each State and Union Territory, to ensure expeditious utilization in efficient and transparent manner of amounts realised in lieu of forest land diverted for non-forest purpose. This would mitigate impact of diversion of such forest land. The proposed legislation also seeks to provide safety, security and, transparency in utilization of these amounts, which currently are being kept in Nationalised Banks and are being managed by an ad-hoc body. These amounts would be brought within broader focus of both Parliament and State Legislatures and in greater public view, by transferring them to non-lapsable interest bearing funds, to be created under public accounts of the Union of India and each State. The proposed legislation will also ensure expeditious utilization of accumulated unspent amounts available with the ad hoc Compensatory Afforestation Fund Management and Planning Authority (CAMPA), which presently is of the order of Rs. 38,000 crore, and fresh accrual of compensatory levies and interest on accumulated unspent balance, which will be of the order of approximately Rs. 6,000 crore per annum, in an efficient and transparent manner. Utilization of these amounts, will facilitate timely execution of appropriate measures to mitigate impact of diversion of forest land, for which these amounts have been realised. Apart from mitigating the impact of diversion of forest land, utilisation of these amounts will also result in creation of productive assets and generation of huge employment opportunities in rural areas, especially in backward tribal areas. Expenditure of the National CAMPA is proposed to be met from the funds to be retained in the National Compensatory Afforestation Fund (CAF) from the accumulated funds transferred to it by the ad-hoc CAMPA, and the funds to be transferred, on yearly basis, to the National CAF from a part of the funds credited by user agencies directly into State CAFs. The proposal, therefore, does not involve any additional expenditure on the Centre. i. Establishment of the National CAF and the State CAFs to credit amounts collected by State Governments and Union Territory Administrations to compensate loss of forest land diverted for non-forest purpose. ii. Constitution of a National Authority to manage and utilise amounts credited to the National CAF. iii. Constitution of a State Authority in each State and Union Territory to manage and utilise the amounts credited to the State CAFs. iv. Establishment of a Monitoring Group to assist the National Authority in monitoring and evaluation of activities undertaken from amounts released from the National CAF and State CAFs. The Union Cabinet chaired by the Prime Minister, Shri Narendra Modi, today gave its approval for the conversion of two additional battalions of the Sashastra Seema Bal (SSB) for the National Disaster Response Force (NDRF) and for strengthening existing NDRF battalions. The objective of the conversion of these two additional battalions of SSB into NDRF battalions is to provide response to the area of Eastern Uttar Pradesh, Madhya Pradesh and Arunachal Pradesh during any natural and manmade disaster and to enhance the capability of the existing NDRF battalions. The placement of two NDRF Battalions at Varanasi and Arunachal Pradesh will fill up the vast gap of deployment of the NDRF. ii. rationalizing the procedure for laying draft notifications granting exemptions to various classes of companies or modifying provisions of the Act in Parliament, in order to ensure speedier issue of final notifications. These Official Amendments will address issues related to ease of doing business and put in place a speedier process for approval of draft notifications for providing exemptions etc. from specific provisions of the Act to a class of companies. The Union Cabinet chaired by the Prime Minister, Shri Narendra Modi, today gave its approval for the introduction of the Merchant Shipping (Amendment) Bill, 2015 and accession to the International Convention for the Control and Management of Ships' Ballast Water and Sediments, 2004 (Ballast Water Management Convention) of International Maritime Organization (IMO). The Convention requires all new ships to implement an approved Ballast Water and Sediments Management Plan. All new ships will also have to carry a Ballast Water Record Book and follow ballast water management procedures to a given standard. Existing ships will be required to do the same but after a phase-in period. Ships are required to be surveyed and certified and may also be inspected by Port State Control officers who can verify that the ship has a valid certificate. They can also inspect the Ballast Water Record Book and in some situations, sample the ballast water. The Merchant Shipping Amendment Bill, 2015 incorporates into the Merchant Shipping Act, 1958 the enabling provisions required for implementing the Convention. Indian ships of 400 Gross Tonnage (GT) and above on international voyages are required to possess an International Ballast Water Management Certificate. Indian ships below 400 GT plying within the territorial waters of India shall be issued an Indian Ballast Water Management Certificate. Ships which are not designed/constructed to carry ballast water, warships, naval auxiliary or other government-owned non-commercial ships are exempted. Port authorities will be statutorily obliged to provide ballast water sediment reception facilities. Indian and foreign Ships of 400 GT and above are required to carry onboard a Ballast Water Management Plan. Ships of 400 GT above shall also be subject to survey and inspection. During inspection sample of ballast water can be analyzed (but this sample analyzing process should not cause undue delay in the operation/departure of the ship). If a ship complies with the convention but is still detained/delayed for inspection without any reasonable cause, it will be eligible for compensation/ damages. The proposed Bill also provides for penalty on violation/non-compliance of the provisions. There are no financial implications to the Government. Ports will charge ships for the use of such facilities. Ships fill their ballast tanks with water to stabilize vessels at sea for maintaining safe operating conditions throughout a voyage. Ballast water reduces stress on the hull, provides transverse stability, improves propulsion and maneuverability and compensates for weight. However, ballast water poses serious ecological, economic and health problems due to the multitude of marine species being carried in the process, including Harmful Aquatic Organisms and Pathogens (HAOP).